Mexico: Mayans, Aztecs & Conquistadors – The Great Canadian Travel Co.
Few countries can compete with Mexico when it comes to unleashing the inner Indiana Jones in each of us. Jungle clad temples and abandoned ancient civilisations make way to colonial era towns with cobbled streets and Spanish architecture. 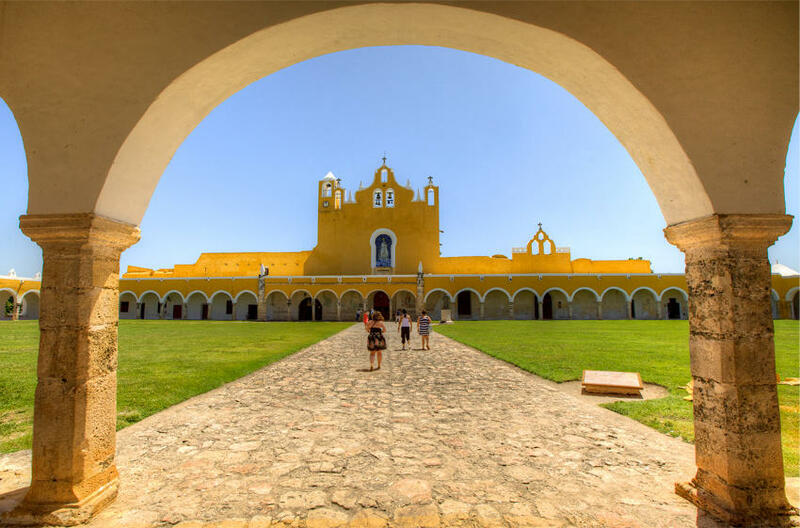 Uncover Mexico’s historical and cultural layers as you journey from the highlands of Mexico City to the jungles and beaches of the Yucatan via the lands of Aztecs, Zapotec, Mayas and Conquistadors. Prices are shown in CA$, per person, based on two people sharing a twin room or one person in a single. 2019 prices vary by date – please ask us for a quote on the trip you are interested in. Flight usually arrive in Mexico City in the evening. You will be met at the airport and transferred to your hotel for the night. No previous travel experience is required for this trip or anything but a basic level of fitness to enjoy the outdoors and relax. 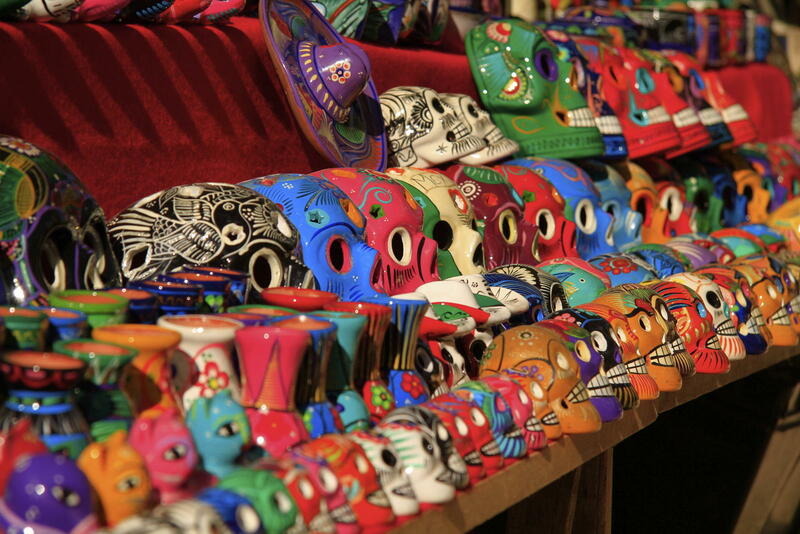 Following a briefing, you head out for a day exploring the bohemian side of Mexico City. You start off by making your way to the south of the city and a particular house hidden behind cobalt blue walls known as Casa Azul. This is where the acclaimed artist Frida Kahlo was born; grew up and, eventually, lived with her muralist husband, Diego Rivera until she died in 1954 at the age of 47. Now a museum, the colonial house, set around a luxuriant garden doesn’t only showcase the collections and personal effects of the two great artists but is a window into the life of affluent Mexican bohemians in the first half of the 20th Century. Next, you visit the quaint neighbourhood of Coyoacan (meaning place of coyotes) with its pebbled streets, colonial churches, bustling little markets and quiet squares. This area was inhabited before the arrival of the Spanish and it is said that the conquistador, Hernan Cortes, made this the first capital of New Spain. 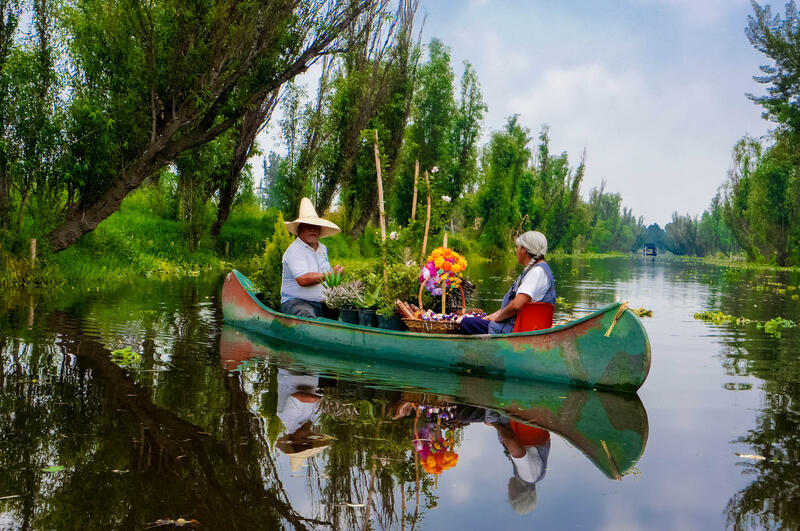 Finally, you will enjoy a relaxing ride on a pre-Hispanic boat along the peaceful waters of the Xochimilco Canals. These scenic waterways would have been used by the Aztecs and today see us enjoying a relaxing journey past floating gardens and little floating kitchens selling local food. You finally return to our hotel in the late afternoon. 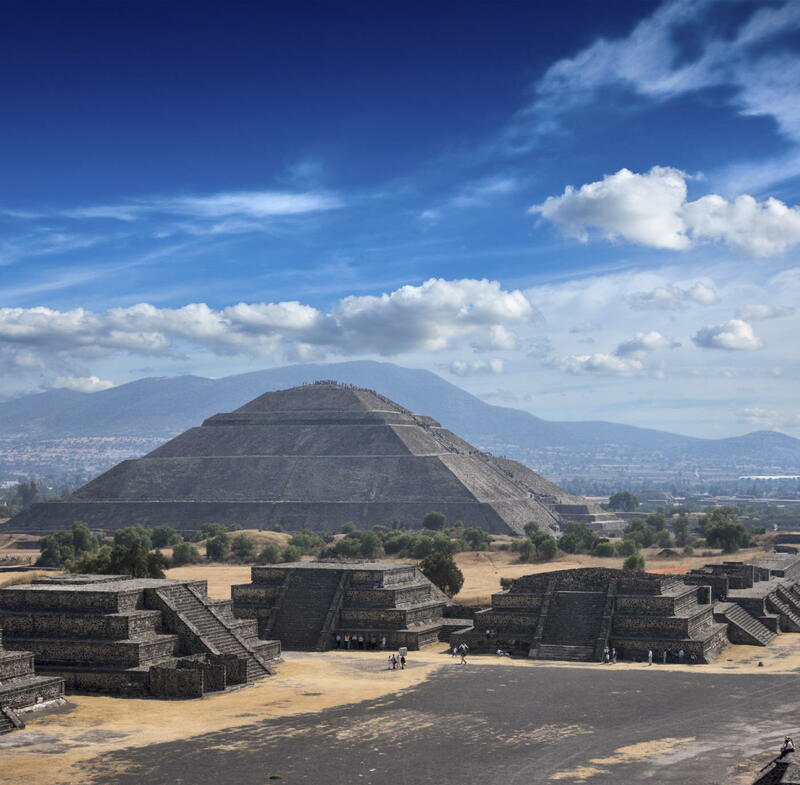 The ancient city of Teotihuacan reached its zenith around 1,000AD when it was the 6th biggest city in the world with a population of about 125,000. Amongst the avenues and structures are the pyramids of the Sun and the Moon, the 3rd and 4th largest in the World. 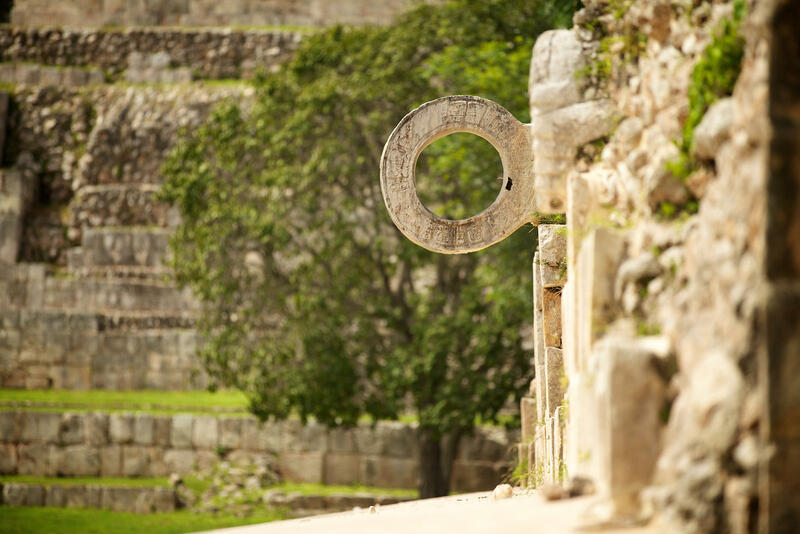 You will explore this impressive archaeological zone with an expert local guide to unearth some of the site’s secrets. Returning to Mexico City you visit the historic centre. Based around the Zocalo (main square) are the Palacio Nacional and the Cathedral Metropolitana. The Palacio Nacional not only contains the offices of the President, the Federal Treasury and the National Archives but also murals depicting pre-Hispanic life and a large mural filling the central stairway depicting the entire history of Mexico from the conquest on. Before leaving Mexico City behind you will visit the Museum of Anthropology and History with its impressive collection of artefacts from Mexico’s many civilisations. Starting your journey south you head towards the city of Puebla (about 4.5hrs). En route you will visit Cholula, home to the largest pyramid base in Mesoamerica with a 16th-century church built on top of it. On a clear day there are good views of Popocatepetl Volcano. In the late afternoon you will arrive in Puebla de los Angeles, the City of Angels – so called because of a legend that claims angels came down from heaven to place the cathedral’s bells in the towers when builders were unable to do so. The colonial city is known for its traditions, especially its handicrafts, including blue-and-white pottery, and its cuisine that is some of the best in Mexico. You will spend this morning discovering the city of Puebla which has been given UNESCO World Heritage Site for its colonial architecture. You visit the Patio de los Azulejos and the ex-Convent of Santa Rosa, both of which provide classic examples of how ‘talavera’ tiles were incorporated into buildings, inside and out. Early settlers who came from Talavera de la Reina in Spain introduced these tiles and associated ceramics. Today the glazed pottery has become synonymous with Puebla. After your city tour you continue your journey and drive towards another Mexican World Heritage City, Oaxaca (about 4.5hrs). With a colonial centre of shaded pedestrian streets, bright, clear light, indigenous traditions and a creative atmosphere, Oaxaca has attracted and inspired many artists and artisans alike. The city boasts such sights as the beautiful zocalo (main square), the Cathedral and the vast Convento de Santo Domingo, along with museums, fascinating markets and charming inns. Your next exploration of Mexican history takes you to the Zapotecan site of Monte Alban. Whilst the name dates back to a Spanish landowner in the 16th-century, previous names come from the Mixtec word ‘Sahandevul’ meaning ‘At the foot of the Sky’ or the Zapotecan ‘Danibaan’ meaning ‘Sacred Mountain. 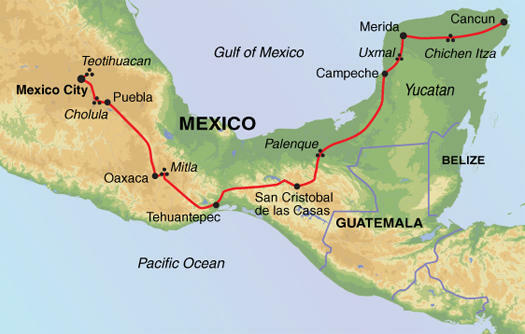 In 500 BC the Zapotecans moved into the Oaxaca region and began the monumental task of levelling the top of a 1,600m high mountain that intersects and divides three valleys. Here they built the city of Monte Alban with a maze of subterranean passageways, rooms, drainage and water storage systems. 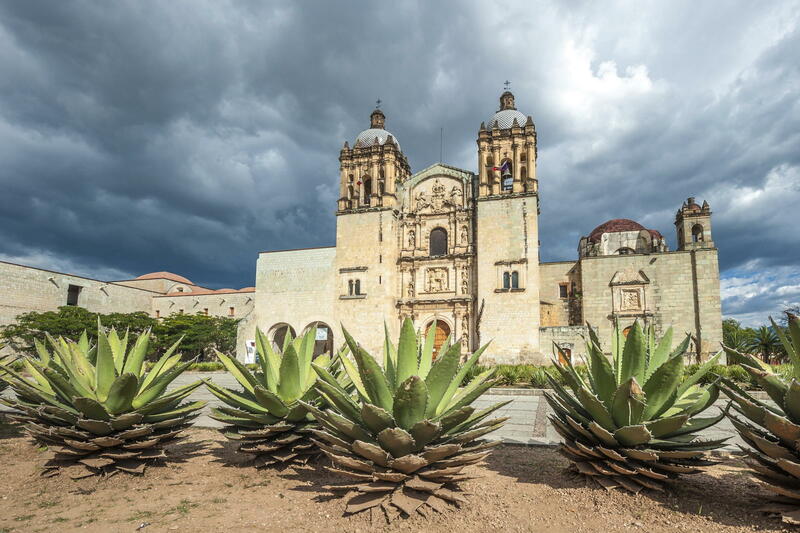 You later return to Oaxaca and explore the cobbled streets and vibrant squares and churches of the historical town. You will also visit the Museum of cultures Santo Domingo. Oaxaca is possibly the most famed region in Mexico for its cuisine and you get more acquainted with it as you head for a cooking class, learning dishes that can easily be recreated at home. The exact menu can change but you generally learn how to make two types of tortilla, three different salsas, guacamole, mole, a starter, a soup, a desert and a drink. You will visit a local market where different ingredients are showcased and explained before returning to the restaurant for your class and a succulent lunch. A short distance from Oaxaca is the village of Teotitlan del Valle known for its colourful, hand-woven rugs and your first stop today. From here you continue to the Don Agave distillery to taste some mescal. Distilled from agave plants, mescal is different to tequila and is most popular in the Oaxaca region. You next head to Mitla, another Zapotecan city which contains tombs of kings and priests and which roughly dates from the 200-900AD. Drive to San Cristobal (about 6hrs plus stops). 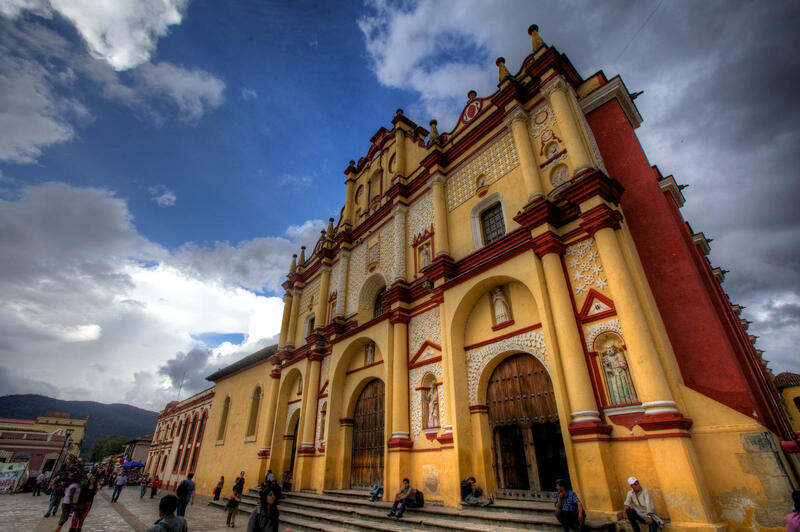 One of Mexico’s most popular cities with visitors, San Cristobal de las Casas is filled with cobbled stoned alleyways of whitewashed buildings with red-tiled roofs that give onto plazas and picturesque arcades. Upon arriving in San Cristobal in the afternoon you will have a short orientation tour of the historic city before checking into your hotel. Today is a free day to explore San Cristobal at your own pace. 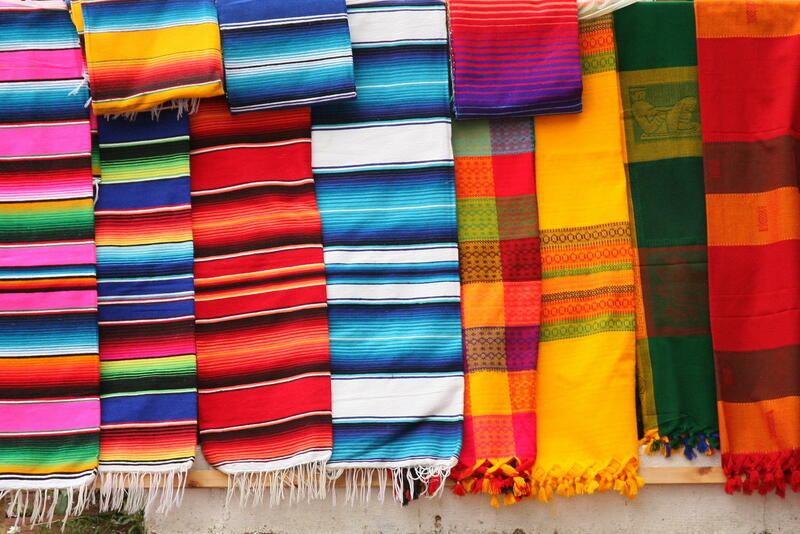 Wander the colonial streets, take in the lively cafés, or buy handicrafts produced by the local Tzotzil indigenous groups with their different colourful dress. It’s also possible to do an optional boat trip through the Sumidero Canyon and/or visit one of the traditional Mayan communities who live in the villages surrounding the city. The road you be taken on towards Palenque is very windy but picturesque. En route you will visit the waterfalls of Agua Azul (after about 5hrs driving plus stops). Agua Azul is a group of beautiful waterfalls that create wonderful natural pools and has been a protected area since 1980. Following a stop at the falls it’s a further 2.5hrs to the town of Palenque, named after the nearby impressive ruins. Emerging from the jungles of the Chiapas’ low-lying hills is one of Mexico’s most impressive ruins: the Mayan site of Palenque. The temples, sanctuaries and pyramids, with their sculptured walls and ceilings are some of the best-preserved and finest examples of Mayan buildings despite the city-state having peaked over 1,300 years ago in the 7th century. You will explore this magnificent site before continuing on the road towards the Yucatan Peninsula and the Caribbean town of Campeche (about 5hrs plus stops). Yet another UNESCO World Heritage Site, the colonial town’s best feature are its impressive city walls built to protect it from the constant attacks by English and Dutch buccaneers and pirates during the 16th and 17th centuries. About two hours drive from Campeche is your second Mayan site: Uxmal. Quite open, it is in contrast to the jungle-ruins of Palenque we visited yesterday. This site, which dates to the late classic era (500-800AD) and features the Pyramid of the Magician; the Nunnery Quadrangle with long, elaborately carved facades; and a ball court where a traditional ball game was played, sometimes ending in human sacrifice. 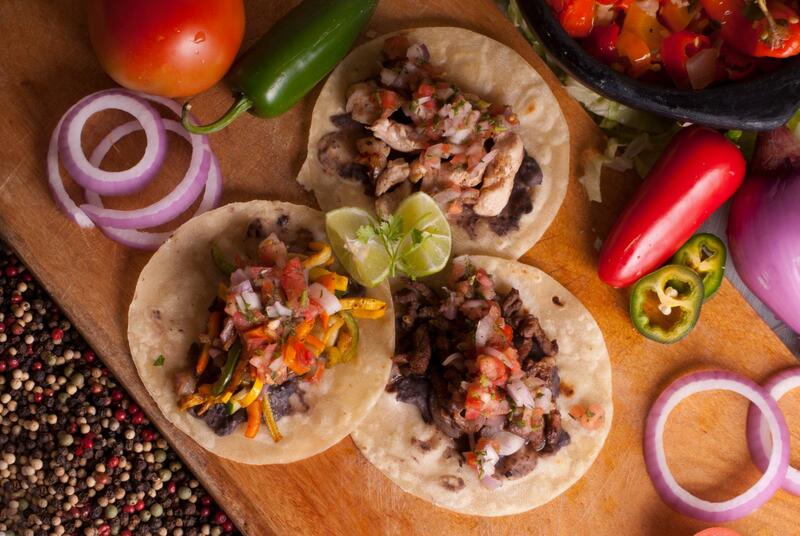 Having worked up an appetite you will have lunch at a local Mayan family restaurant. Here you will get to eat Pollo Pibil and Cochinita Pibil – slowly cooked pork and chicken. The meat is roasted for about 5hrs along with achiote past and wrapped in banana leaves. This is a typical Yucatan dish and representative of the local cuisine. After lunch it’s about 1.5hrs drive to Merida. A number of the city’s buildings, including the cathedral, were built using Mayan stones found on this site and, along traditional colonial architecture, features 19th century houses built in a French style. Arriving mid-afternoon you will have a walking tour of Merida, returning later to enjoy the main square which is particularly delightful at night. Your first stop is at the traditional Mayan village of Tixkokob where local families practice the age-old craft of hammock weaving. After learning about how hammocks are made you will continue to the ‘magic town’ of Izamal. Once a Mayan settlement, the name means ‘Place of the God of Medicine’. The town is covered in buildings painted yellow and white and is known for the 16th century Franciscan monastery built on top of the base of a huge Mayan pyramid (which was probably once larger than the Castillo in Chichen Itza). 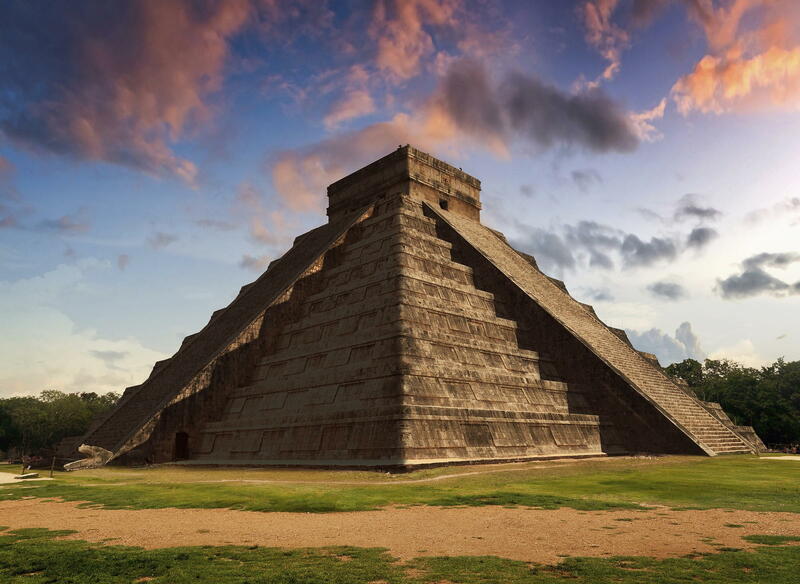 From here you will transfer to Chichen Itza, possibly the best known and most impressive of all Mayan sites. You should arrive early enough to enjoy the beautiful hotel and gardens where you will spend the night right by the ancient site (total drive time of about 3.5hrs plus stops). Your final day starts with a visit the most famous Mayan temple city: Chichen Itza. Having spent the night right by the site means you can get in nice and early before the hordes of day-trippers coming from the beach resorts. Chichen Itza served as the political and economic centre of the Mayan civilisation and thrived from around 600 to 1,200AD. The pyramid of Kukulkan, the Temple of Chac Mool, the Hall of the Thousand Pillars and the Playing Field of the Prisoners can still be seen today and demonstrate the extraordinary commitment to architecture, space and composition. The pyramid itself was the last, and possibly the greatest, of Mayan pyramids. This afternoon you will be driven about 2.5hrs to Cancun airport in time for the group flight.